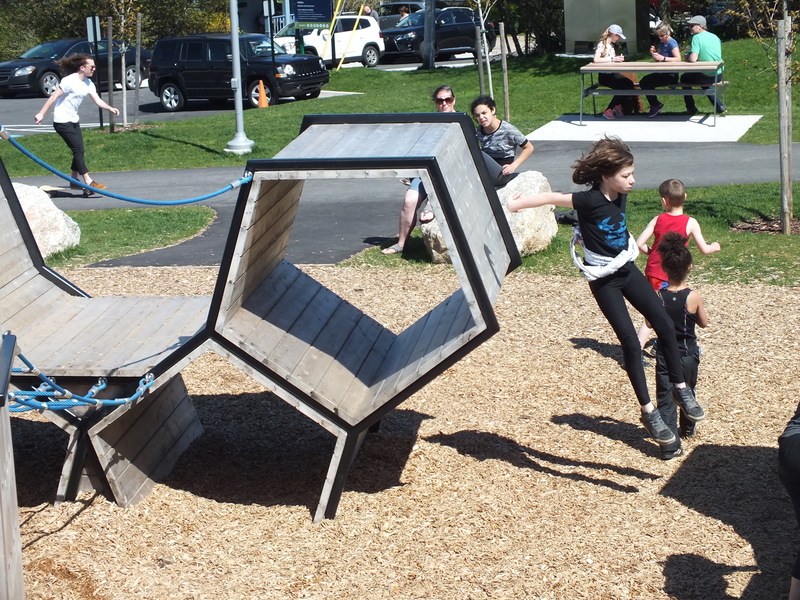 A recently published article in Quartz quotes American landscape designer and researcher Meghan Talarowski commenting on the generally unenviable state of playgrounds in the US. She doesn’t pull any punches. 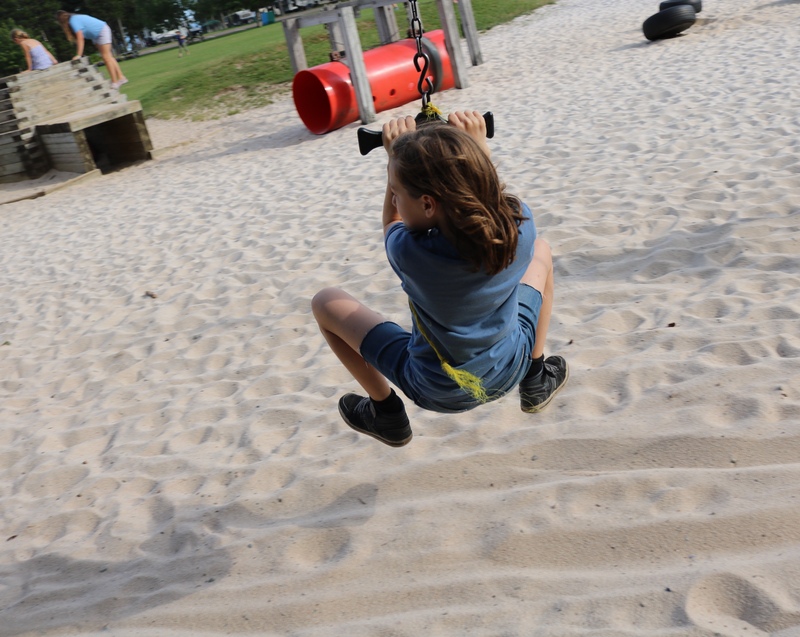 In comparison to some European jurisdictions, she characterizes the bulk of American playgrounds as uninspiring at best – well, perhaps ‘insidiously boring’ is a tad harsher. 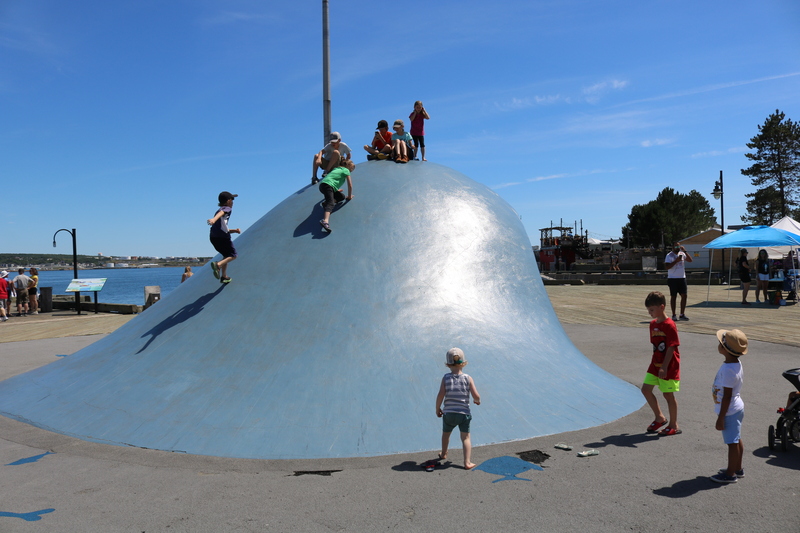 The UK’s Tim Gill, also quoted in the provocatively headlined Why the Danes encourage their kids to swing axes, play with fire, and ride bikes in traffic, empathizes with Talarowski’s observations. Gill suggests that Canada and Australia may be ‘turning the corner’ en route to a better place, not to be confused of course with American comedy darling The Good Place. Tim’s assessment that change is afoot in Canada rings true for me. 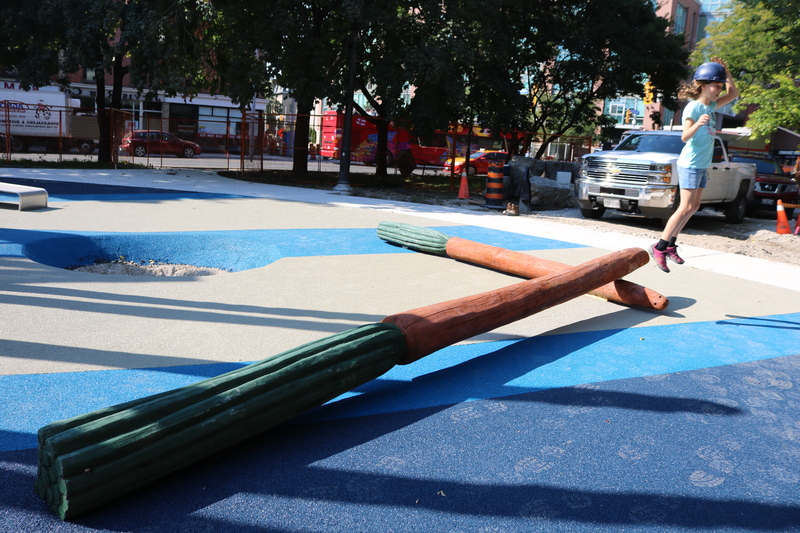 There is a play awakening among educators, researchers, health and recreation professionals, designers, builders, planners. foundations and granting institutions and, the media. Prior to the International Play Association Triennnial Conference in Calgary held just over a year ago, I published CanadaPlays Eh? 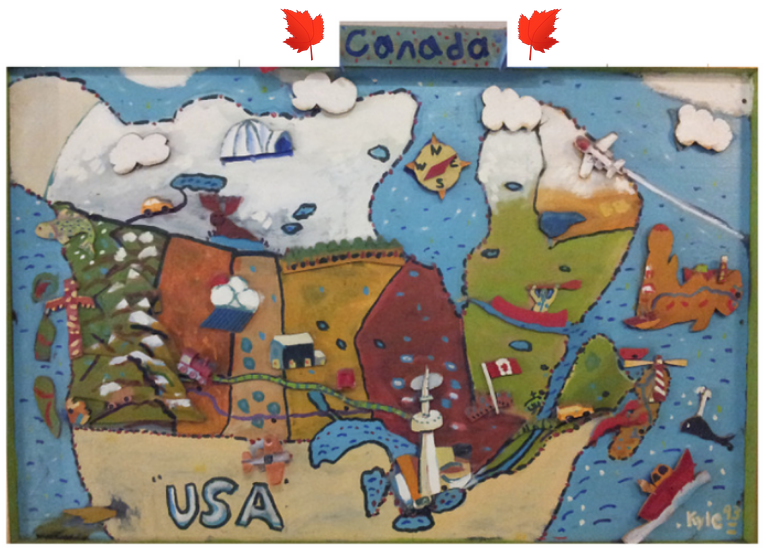 It’s a sampler, a roll-up of some of the activity that’s been shaking north of the 49th parallel. 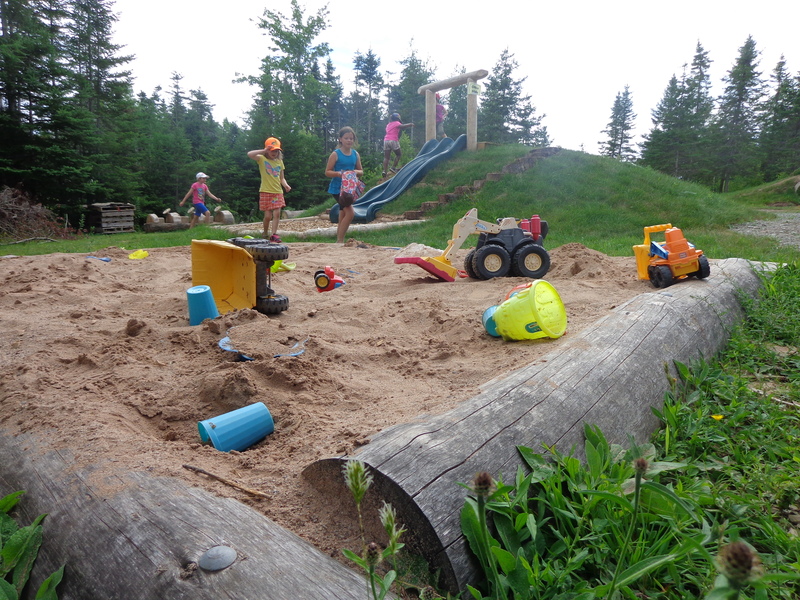 PlayGroundology‘s home in Nova Scotia is a case in point. For starters, we’re probably the only jurisdiction in the world with an official, decades old tagline that includes the word ‘playground’. That’s right, festooned on on our motor vehicle license plates is the true blue catch phrase, Canada’s Ocean Playground. Yup, that’s us up above there in Kyle’s painting just to the left of the whale and the fishing boat ….. While momentum may not be screaming out of the gates, we can safely say it’s picking up steam. 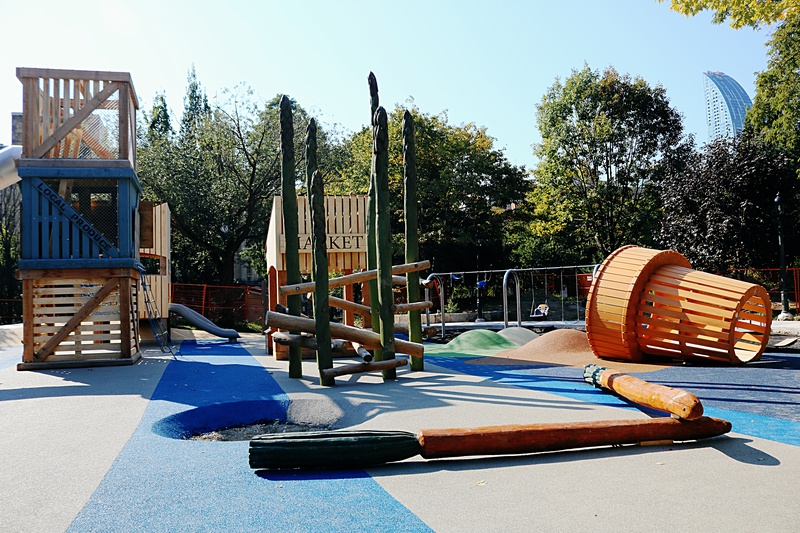 There are alternatives to the world of underwhelming playspaces. 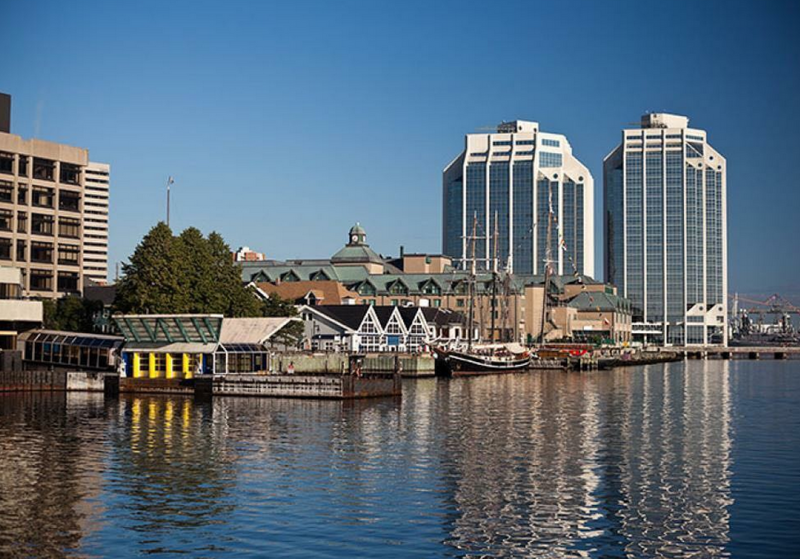 From Nova Scotia’s Northumberland shores, to the meandering Musquodoboit River, to Halifax’s urban beat, greater variety and an openness to deviate from off the shelf solutions seem to be catching on. 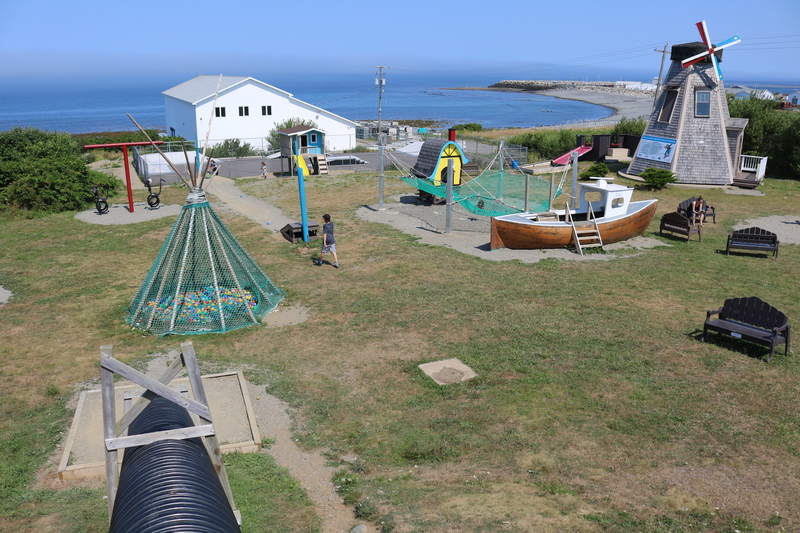 Overlooking the mouth of St. Mary’s Bay in Meteghan, Nova Scotia is a play smorgasbord in the vernacular tradition. It is of the place. 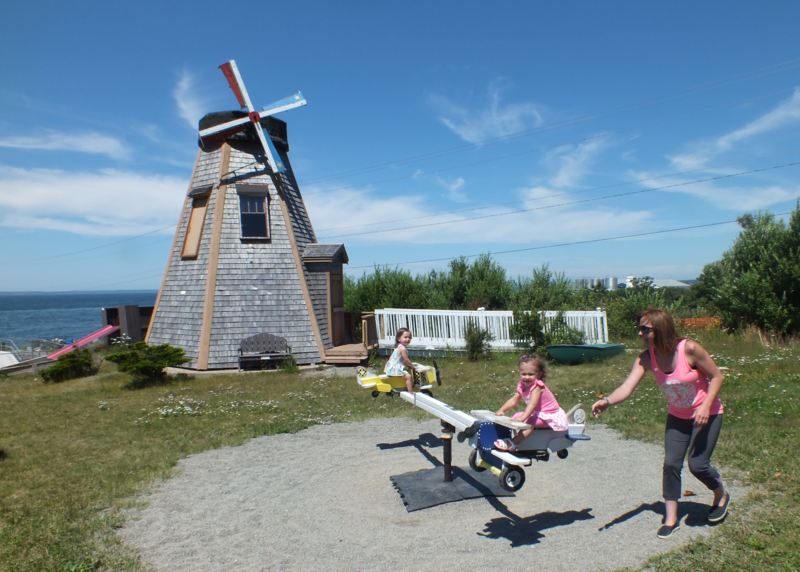 At each turn there is a handcrafted invitation to jump, climb, explore – a windmill, a tipi, boats, sheds and cabins, trains, heavy equipment, fishing nets, bouncing buoys and airplane whirligigs. 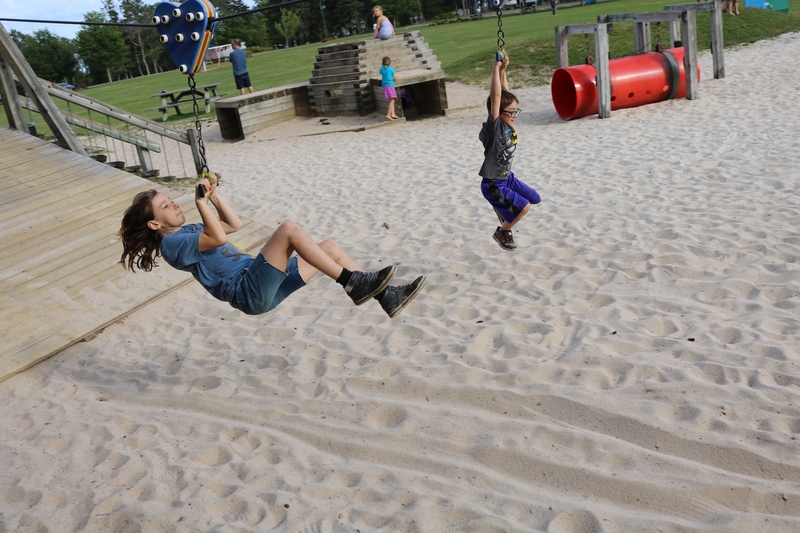 Lovingly conceived and maintained, the Meteghan Family Fun Park receives widespread community support. 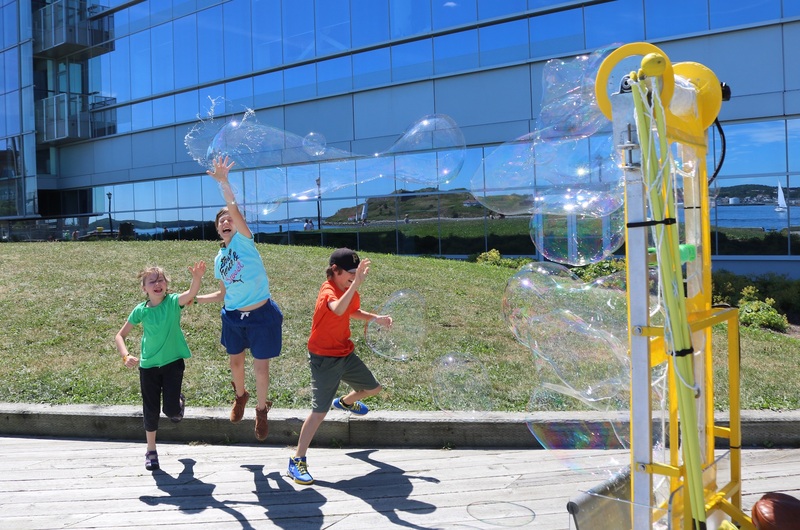 A local dentist rallied the community and the space is now a destination for families along the 100+ kilometer stretch of the Acadian shore. Individuals, businesses, service organizations and government have all helped in one way or another. Virtually every structure and each piece of equipment display a plaque bearing the name of the individual or business whose donation and/or volunteer labour made it possible. 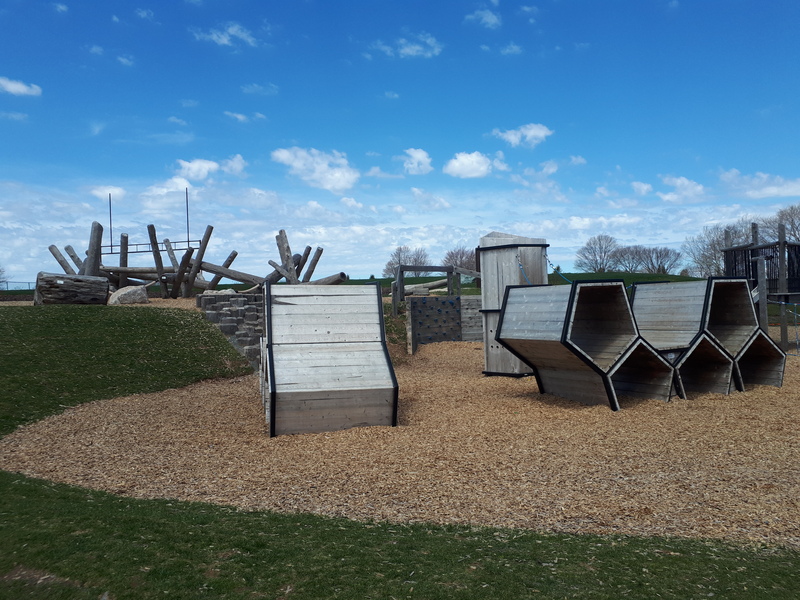 For Meteghan and the surrounding towns this space is a celebration of community that puts childhood play front and centre. 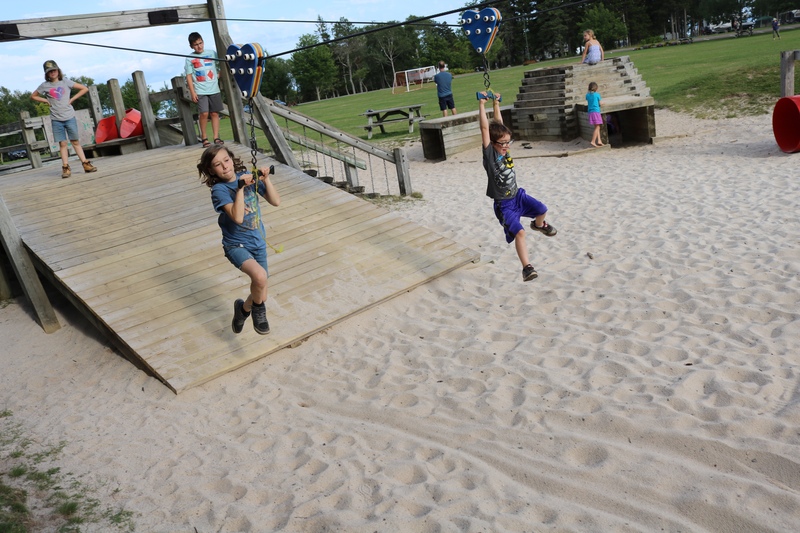 Three hundred kilometers to the northeast in a wooded glade is the province’s most expansive playground in a natural setting. 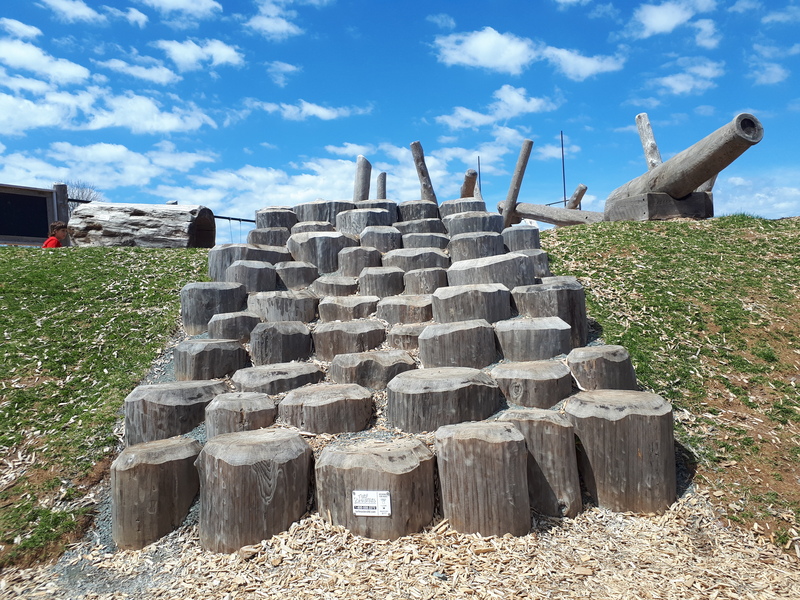 This wonderland came together through the leadership and vision of a small group of individuals working for the Department of Natural Resources, members of the local community and a passionate design-build company – Cobequid Consulting – that couldn’t resist the opportunity to play. 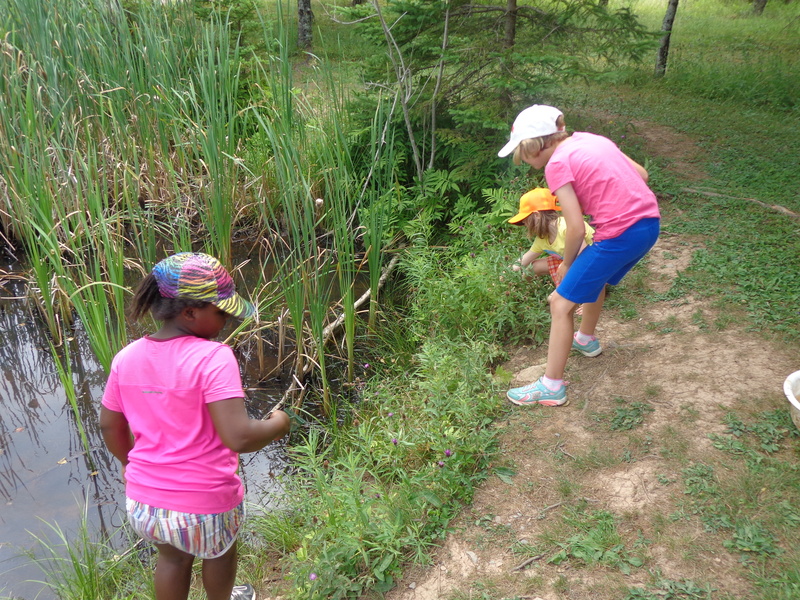 An aha moment for two team members of the Natural Resources Education Centre made all the difference. 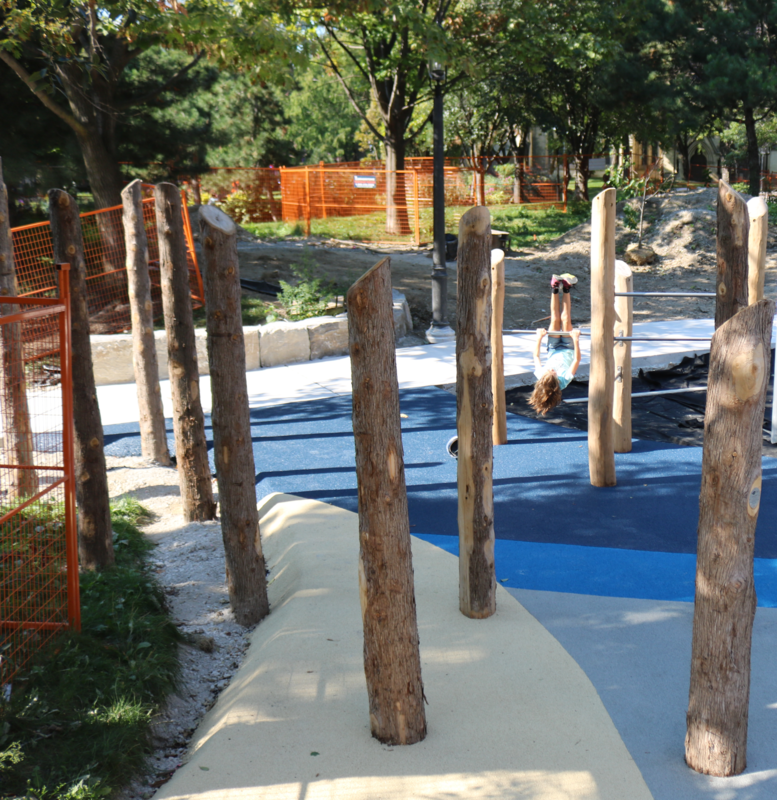 While attending a national conference, a presentation on natural playgrounds ignited their imaginations. 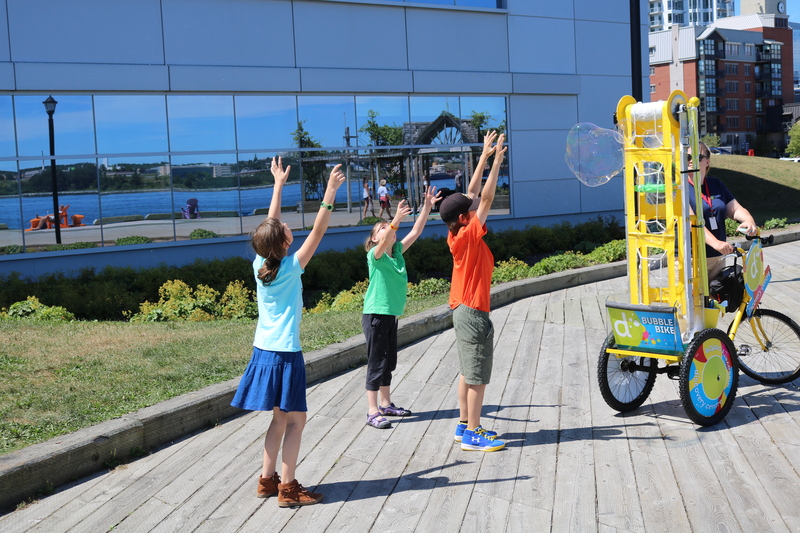 The aha went something like this – “let’s just do it!” To the delight of kids, parents and educators they grabbed that ball of inspiration, brought the game home and slam dunked it. 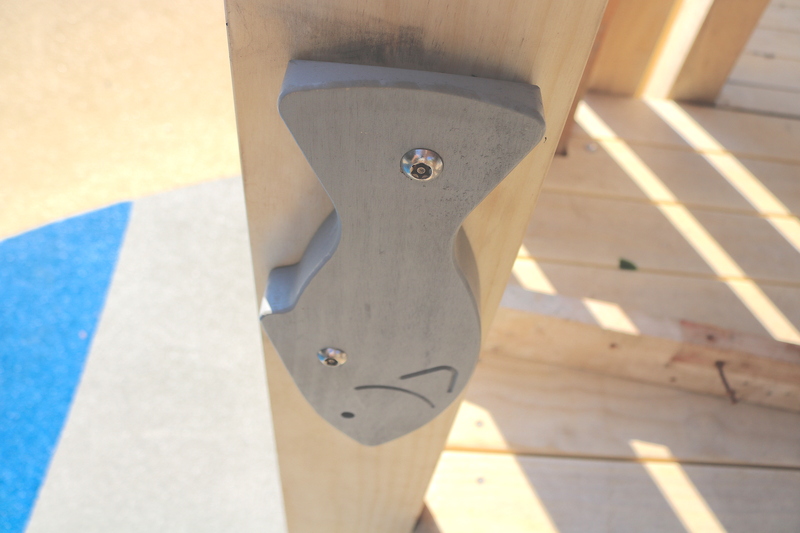 The Nature Learning and Play Space could not have taken root without champions and enthusiastic community buy in. 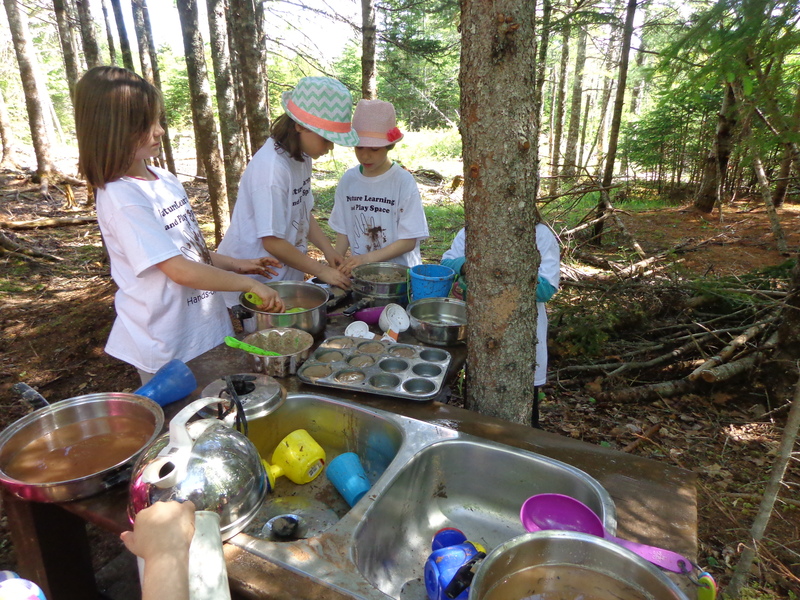 Local grandmas rounded up all the knickknacks and paraphernalia for the mud kitchen – on opening day, there was a seemingly limitless supply of MUD! Contractors provided heavy equipment at reduced rates. Many individuals contributed sweat equity. Perhaps most importantly, supervisors at the Natural Resource Education Centre see the space as an invaluable extension of their work. 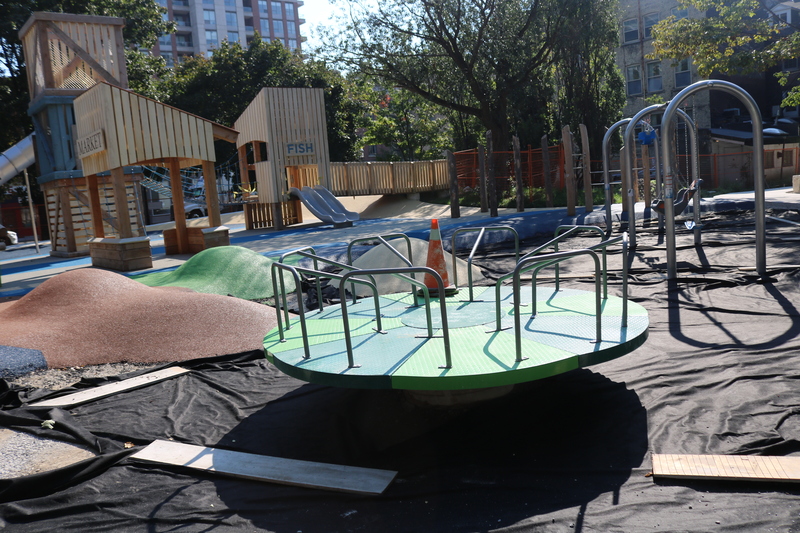 They are able to demonstrate how it aligns with the Centre’s mission and exists simultaneously as a destination playspace. And how many play areas have a bullrush fringed frog pond with brightly coloured dipper nets ready to borrow for catch and release amphibian tales. Spotted salamanders burrowing in the cool mud are also a rewarding treat for young observant eyes. This natural enclave is a revelation and for some urban kids a first time excursion into a wilder, less predictable world. 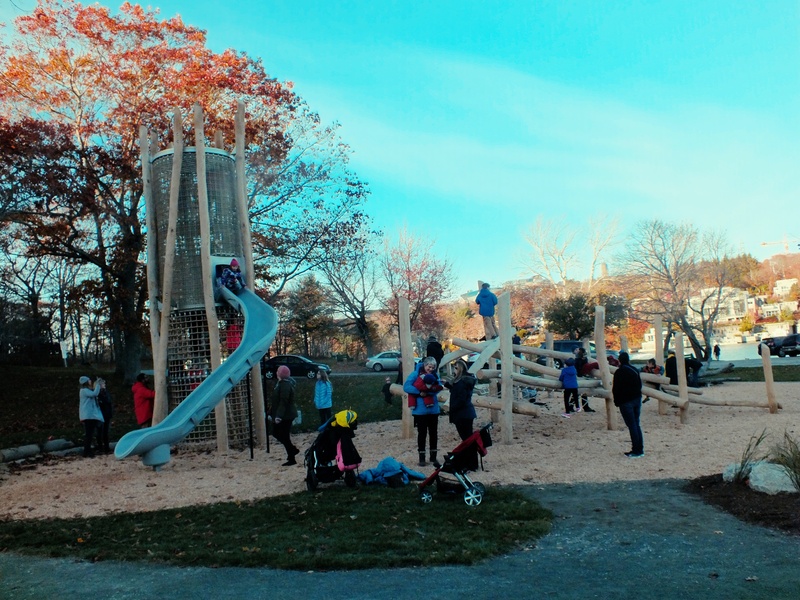 Halifax’s Sir Sandford Fleming Park is home to the city’s first full on example of let’s throw away the standard playground catalogues and entertain a completely different design and build. 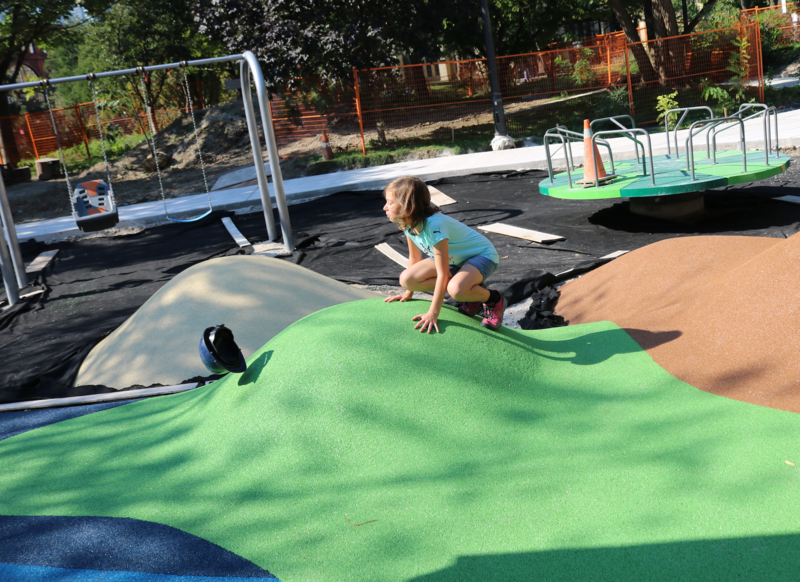 Opening day was an outdoor festival with hundreds of visitors eager to play. 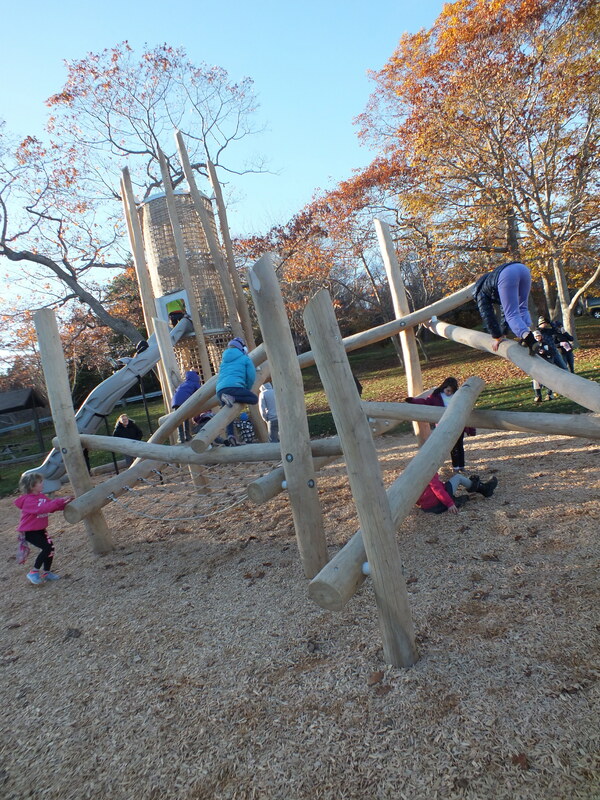 The crisp autumn air kept the kids sauntering, running, climbing and balancing their way through an unfamiliar terrain. 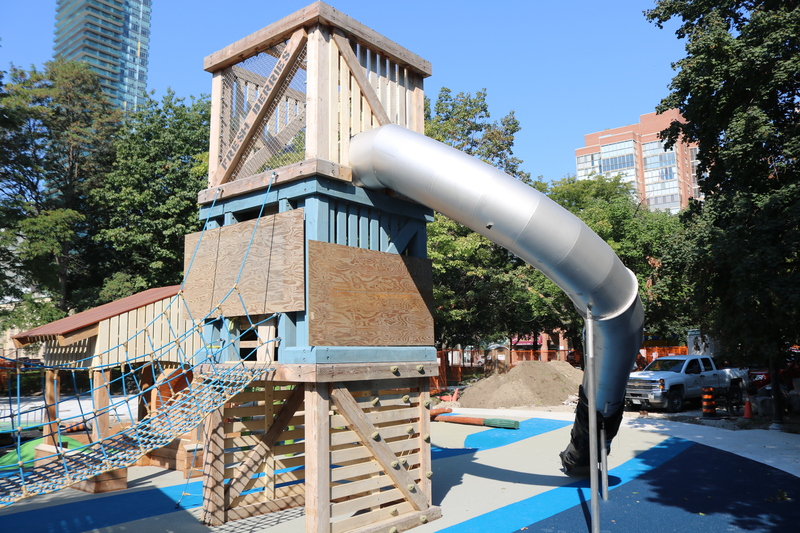 The design by Earthscape, an exciting homegrown Canadian firm working across the country and the US, includes a tower slide, balancing beams, climbers and water station. None of these items had ever seen the light of day before in this part of the world. 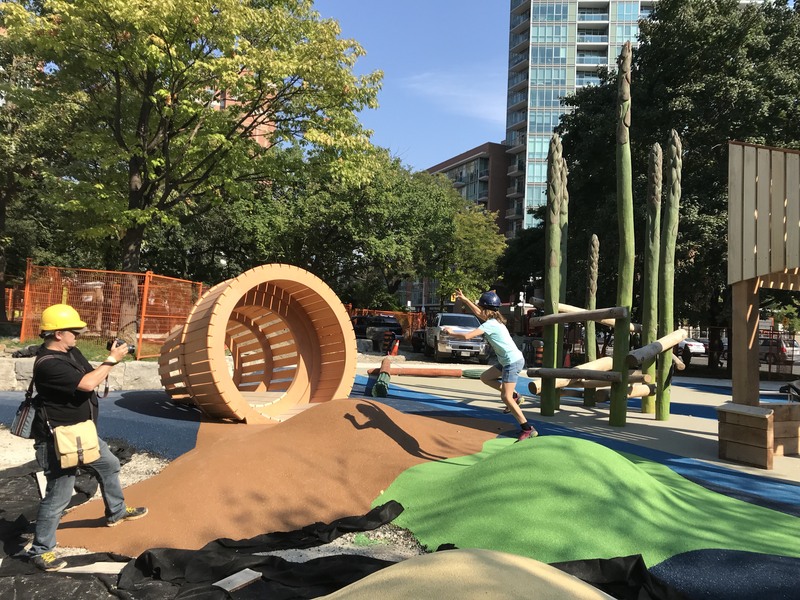 The space is an important trailblazer demonstrating that a wider range of play opportunities for kids in public spaces is indeed possible and popular. The climber/balance beams are a logs akimbo projecting on different planes type of affair. There are challenges here for kids of all ages. For the younger ones, shunting along in a sitting position seems a safe and sure approach. Those embracing a little more derring-do attempt walking up or down the varying inclines. Jumping off also seems to be de rigueur along with rolling about in a net suspended below the main part of the structure. With so much newness in design and playability, it’s tough to pick a favourite. Like beauty, favs are really in the eyes of the beholder. And there are lots of eyes on the water pump. Plenty of hands and feet dipping into the rivulets making channels in the sand. 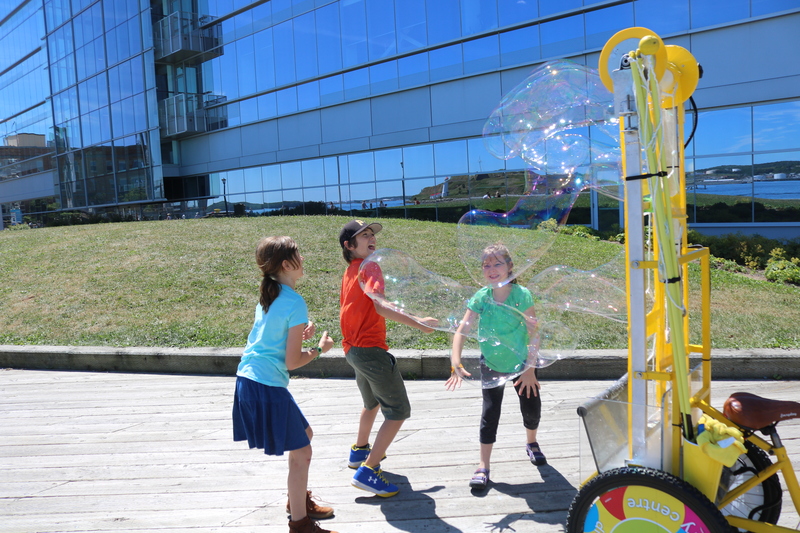 It’s a beacon calling out to all kids – come get WET! Mittens are quickly sopped and footwear is in the just about soaked stage. 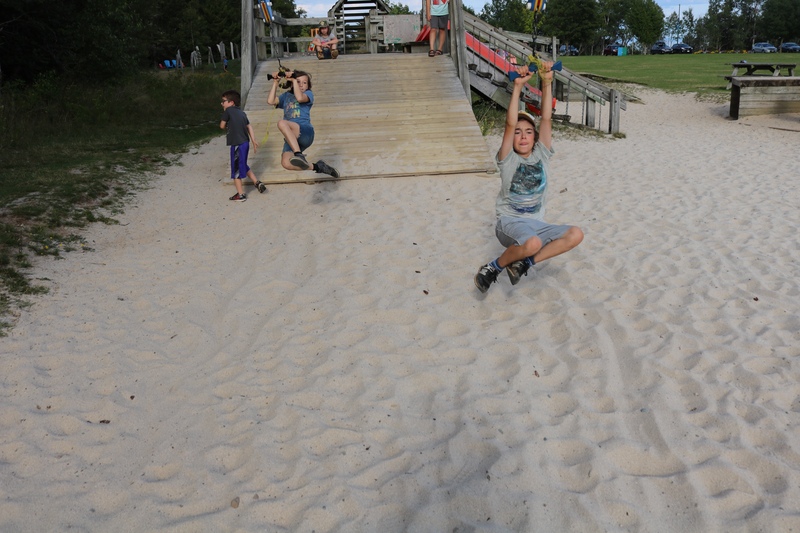 With abundant water and sand, even the cold can’t hold the kids back. 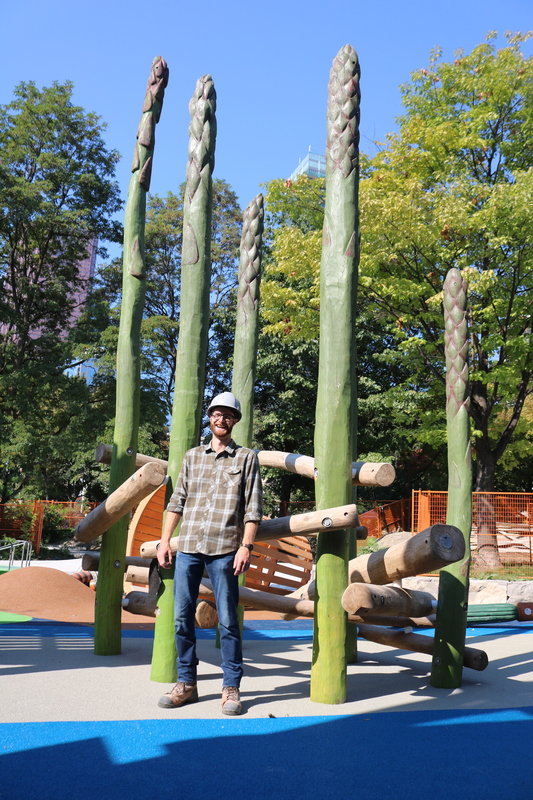 Thanks to the City and Earthscape for stepping up to the plate and hitting one out of the park. 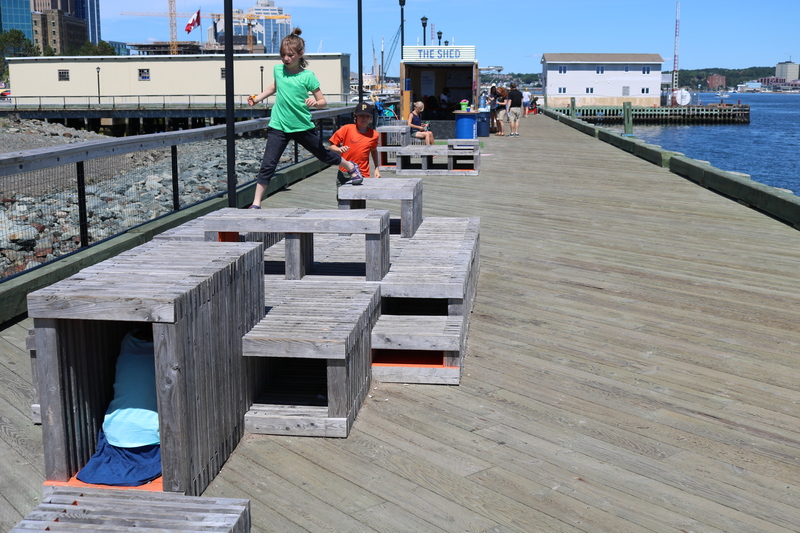 On high ground not far from The Narrows made infamous by the Halifax Explosion 100 years ago, is another new play space that breaks the mould. Wood, wood everywhere – plastic and metal in very limited quantities. Wooden cannons on the hilltop hearken back to the original 18th century Fort Needham that protected Halifax’s Royal Naval Dockyards. The Fort and surrounding neighbourhoods were decimated on December 6, 1917 by a harbour collision involving a munitions ship – 2,000 were killed and thousands were injured. 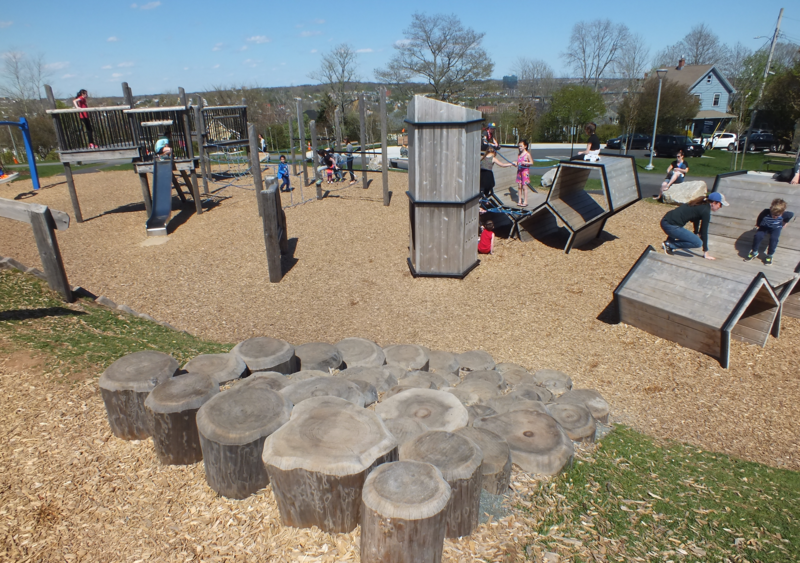 Now this part of the park is a hive of activity – kids zipping back and forth, climbing, balancing, jumping, swinging, shouting, laughing…. It’s a high energy zone complete with wonderful little shaded cubbies where kids can take a breather and get away from it all. 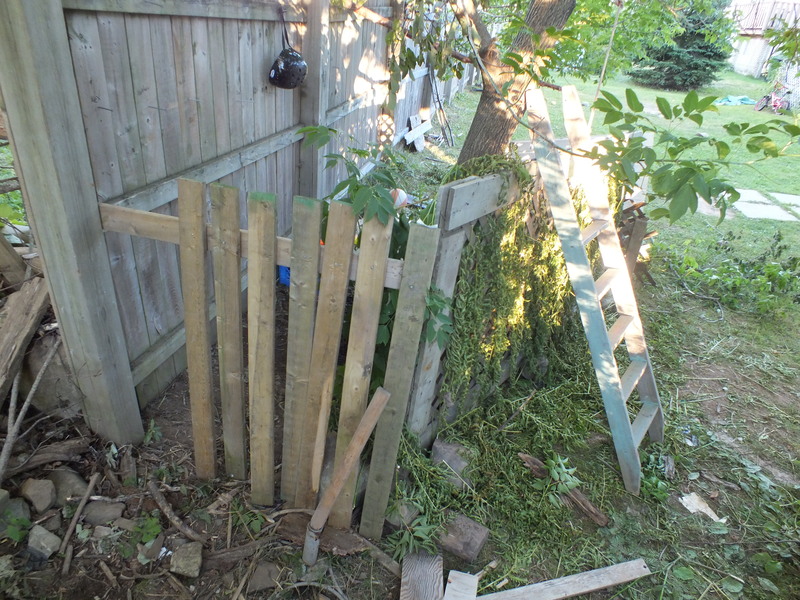 There is parkour potential here too though I don’t know if it has been ‘discovered’. 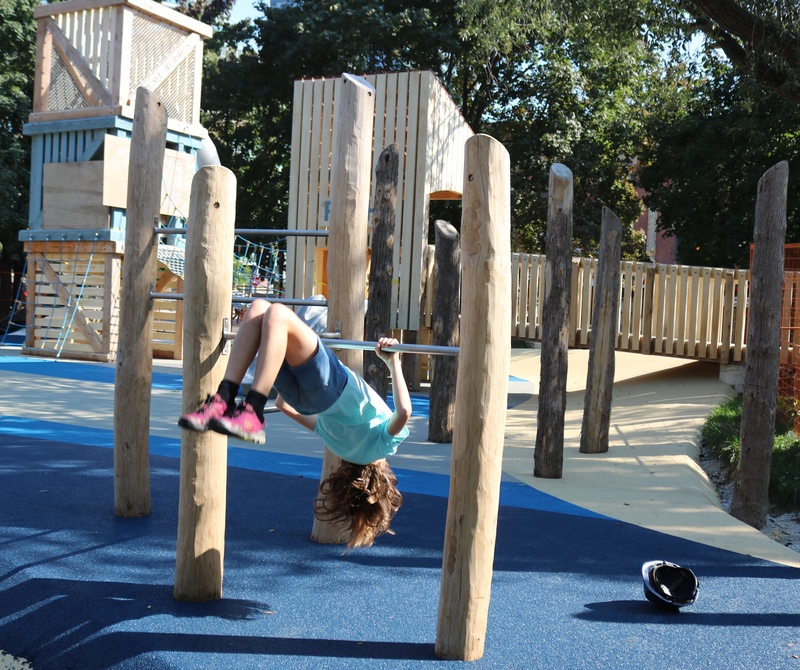 Many pieces of equipment offer kids an open invitation to leap into the blue. The space is designed by Moncton, New Brunswick’s Viridis Design Studio Ltd. and constructed by Nova Scotia’s Turf Masters. There is plenty to explore and keep kids engaged in discovery and the testing of limits and abilities. Our girls didn’t want to leave – always a good sign. 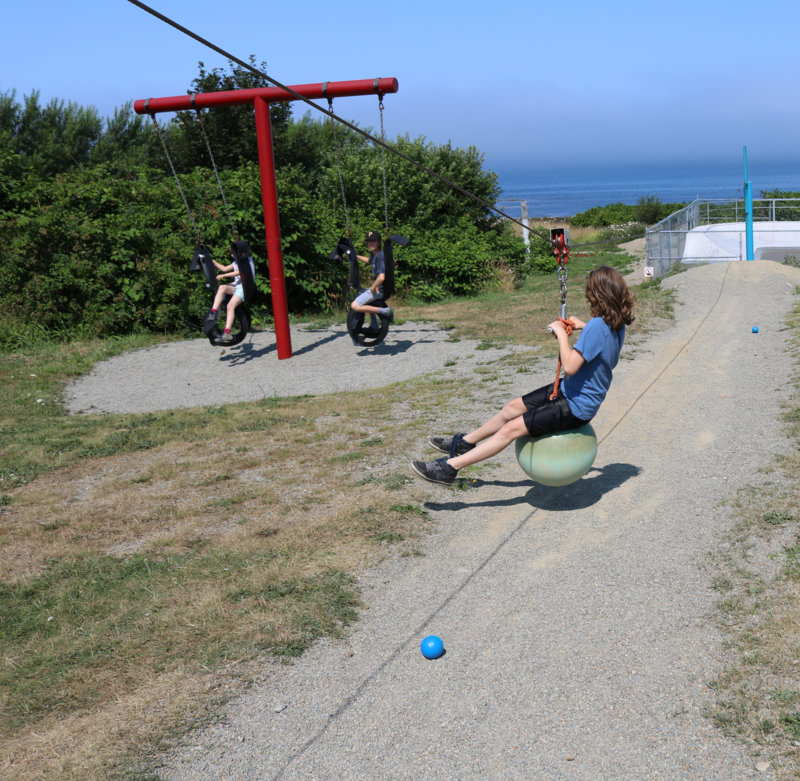 In Halifax, both The Dingle and Fort Needham playgrounds are getting the two thumbs up from kids and parents and families are dropping in from other parts of the city to give these new play hotspots a whirl. 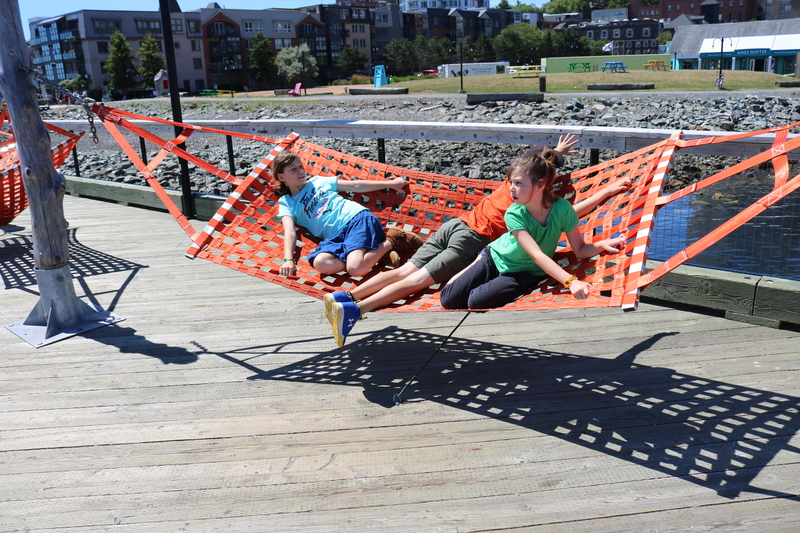 With approximately 400 playgrounds in the city (we are very well served in terms quantity and safety), Halifax could use a few more like these two. 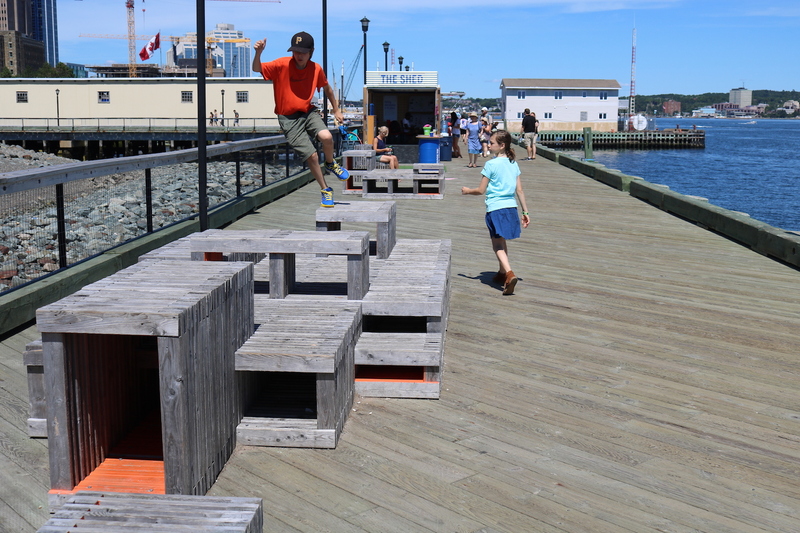 Note – The much missed Halcyon, a fixture on the Halifax waterfront for close to 25 years, was one of the original adventurous playspaces in the city. A life size wooden fishing boat designed for kids featuring actual recycled boat parts and getaway cubbies out of parental vision. We miss you Halcyon. Posted in Cobequid Consulting, Earthscape, Fort Needham Park Playground, Halcyon, International Play Association, Kyle Jackson, Meghan Talarowski, Meteghan, Meteghan Family Fun Park, Quartz, The Dingle, Tim Gill, Turf Masters, Viridis Design Studio Ltd. Skimming inches above the ground attached to a pulley hurtling down the line is an adrenalin charged zip, zip hooray moment. A steady stream of kids cycles through to the top of one of the twin ‘towers’ preparing to be airborne. Two zip lines, four feet apart are an invitation for back and forth races covering a distance of 100 feet. Hands tightly grip batons as the zippers run down the 20º take-off slope before they launch — dangle — zip, or launch — drag — sputter in the sand. This is a legs up course as there isn’t much clearance to glide over the ground surface. Either the lower legs are bent and thrust behind the zipper, or the legs are held in front of the body – both are a real workout for the abs. 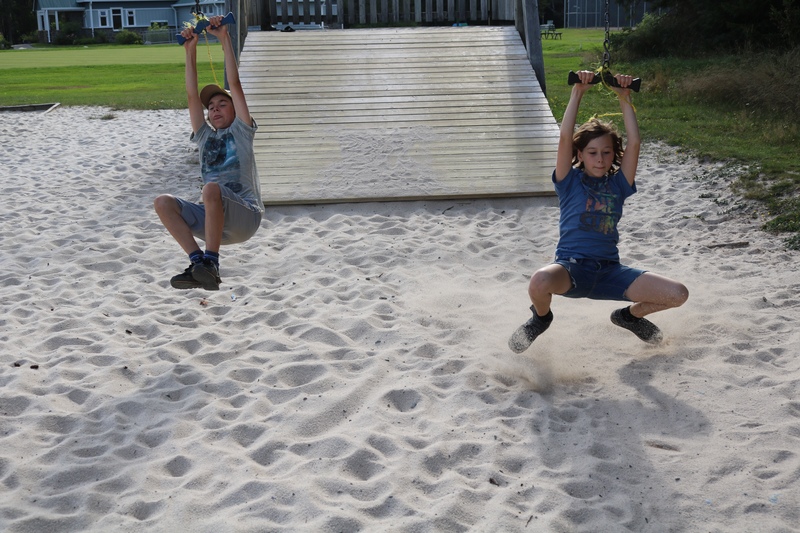 Of course where there are kids, there are variations…. The ‘hopper’ reminiscent of a frog getting ready to spring off a lily pad. And the ‘going for the gusto’ parallel power start. 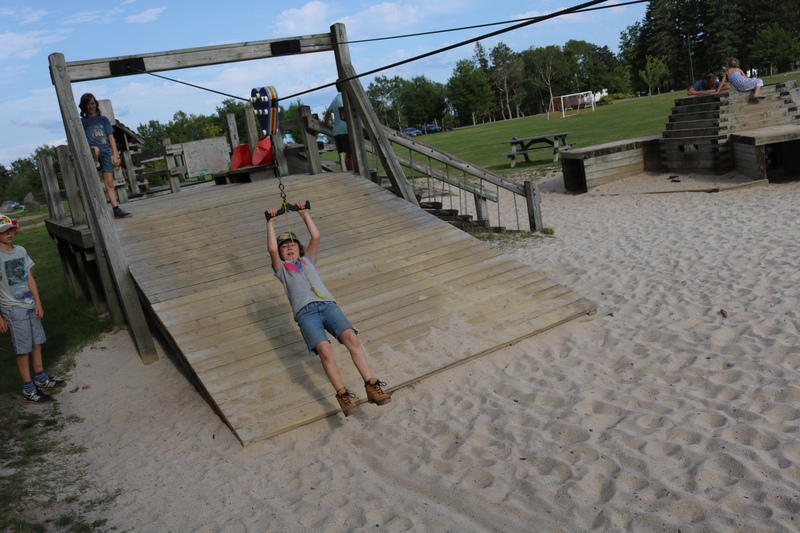 This zip line is located in New Brunswick’s Fundy National Park a two minute drive from the main visitor centre at the Alma entrance. 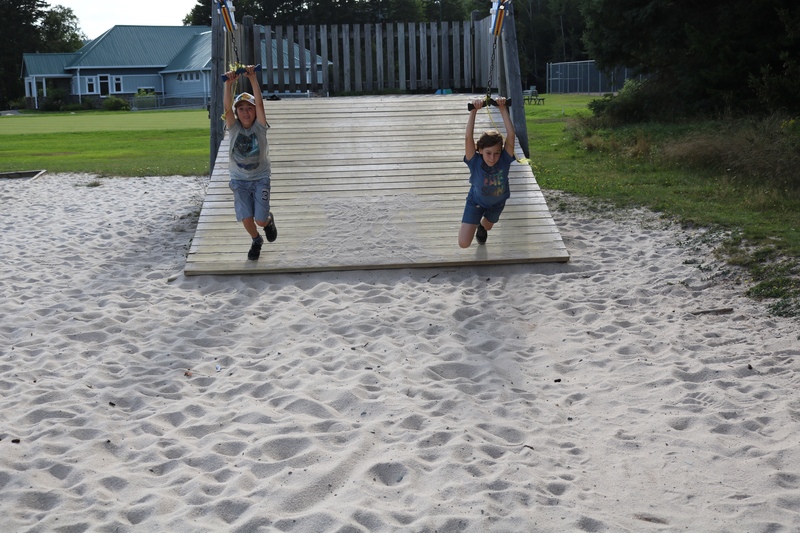 There is a large grassy area, picnic benches and a variety of play structures. Our kids frittered around the other pieces but it was really the zipper that held the day. Truth be told the kids haven’t encountered a functioning zip line they didn’t love. It’s the derringer-do, the exhilaration of defying gravity and yes, where there are double lines, the fun and thrill of racing…..
Great list from Tim Gill on giving kids more freedom in a recent edition of UK Huff Post. Each of the 9 items listed in the article will help kids blaze a trail to greater freedom. Together they are a powerful recipe for fun, discovery and stretching limits. I’m supplementing Tim’s list with 3 additions of my own (10 through 12) to make it an even dozen. Send PlayGroundology a comment if you have items to add to the list. 10. 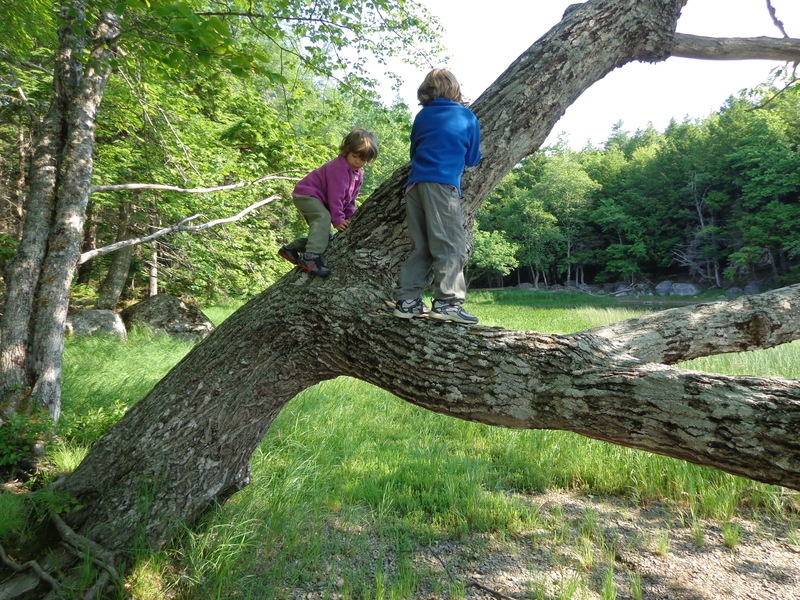 Create opportunities for your kids to explore and play in the natural world. If you have green spaces close to where you live, set the children free to explore. 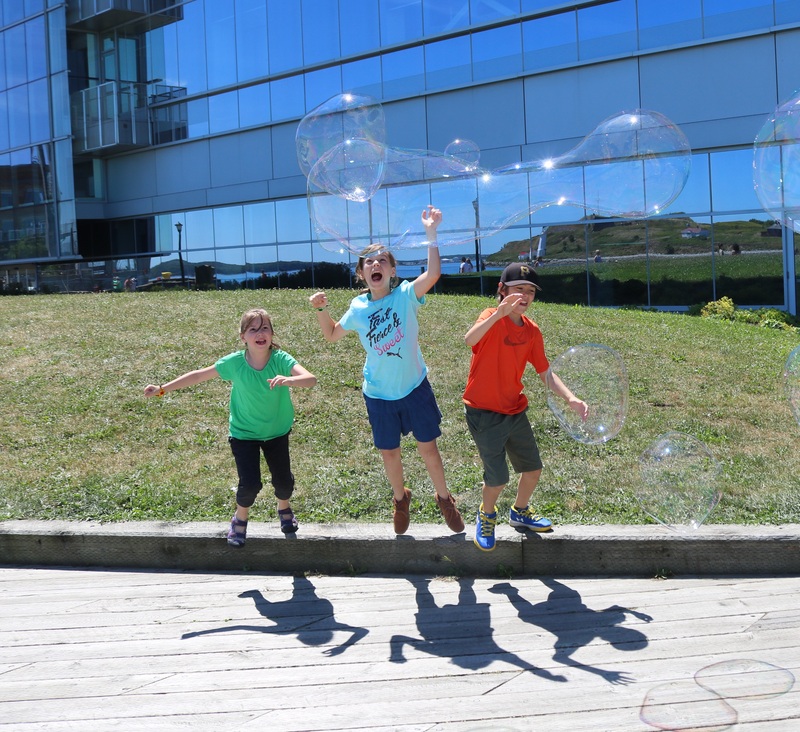 If not, take them to a park, a ravine, to the woods, the seashore – many opportunities for play will present themselves and the benefits of spending time in nature are well documented. Do caution about potential hazards. 11. Make your home a play zone. I’m not talking anything grandiose here, no large infusions of cash for play installations or play houses and such. 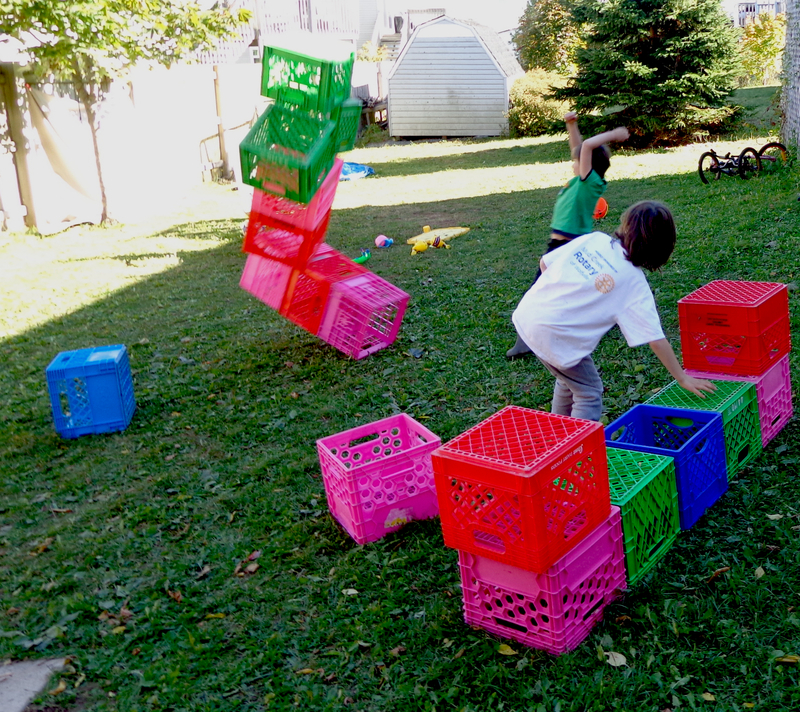 Get a few loose parts – milk crates, tires, inner tubes, tarps, ropes, cardboard boxes, a few planks of lumber and let the kids have at it in the backyard. There are hours of self-directed play and discovery with this kind of material and your yard will become a very popular destination. No backyard? Get a small group of parents together and explore what’s possible on lands managed by your local authority. 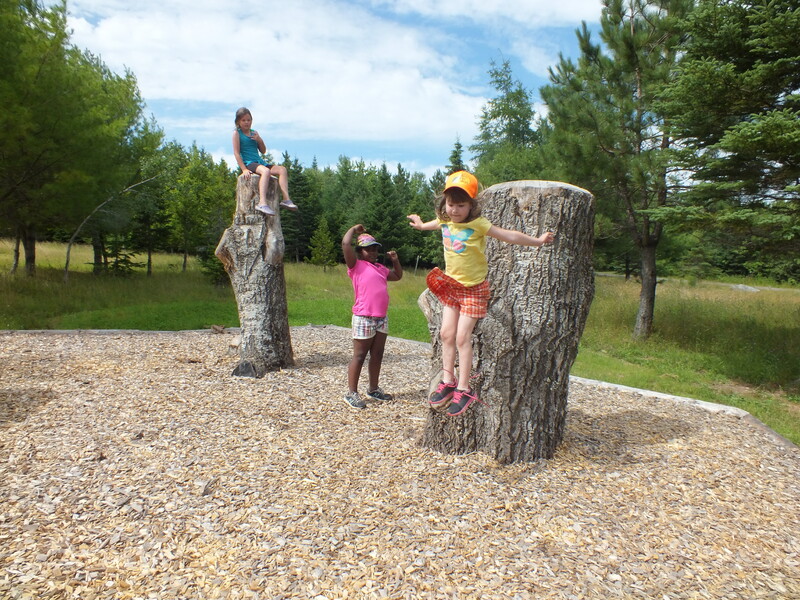 Support play, independence and resilience – get the kids outdoors to explore and have fun. 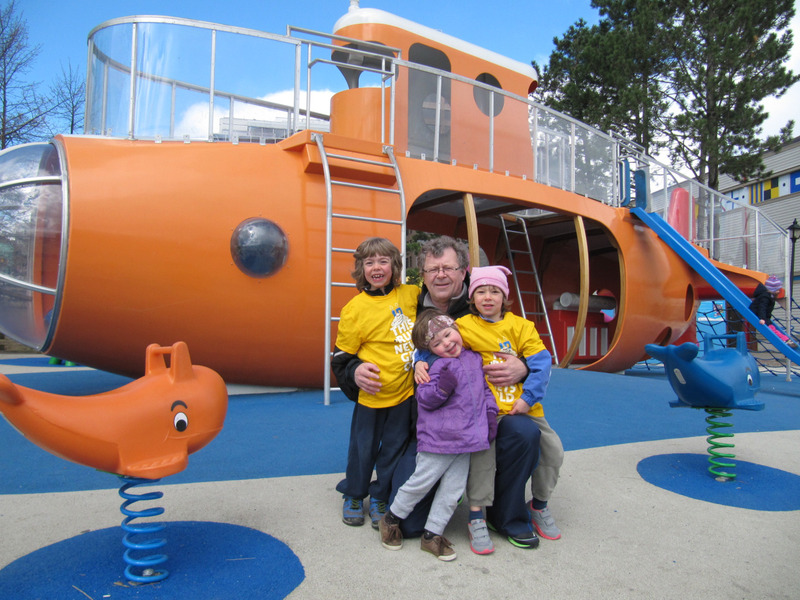 This is a big shout out to the Pop-Up Adventure Play crew – Zan, Morgan and Andy. One year ago, they touched down in Halifax to kick off a very successful cross-Canada summer tour. Click here, or on image for photo story. Kids and adults alike had a great time creating and destroying over the course of nearly three hours on a sun washed summer afternoon. Check out some highlights in the photo story by clicking through above. 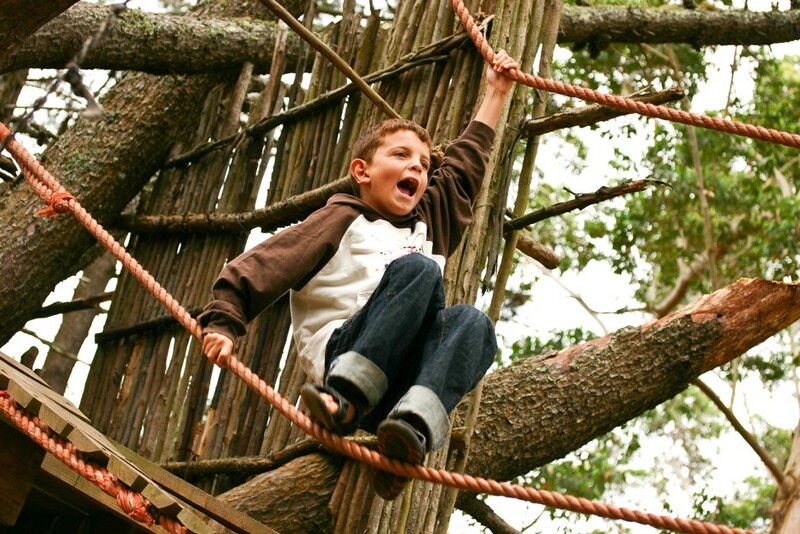 If you are intrigued by pop-up play and loose parts, then maybe Pop-Up Adventure Play’s next Campference in Houston, Texas is for you – details here. I completed the survey last night in just over 15 minutes. This is a great outreach and research tool that CityLab is developing. It’s a strategy that could benefit other publications looking for a broad range of input. Kudos to Atlantic Media for adopting this approach. 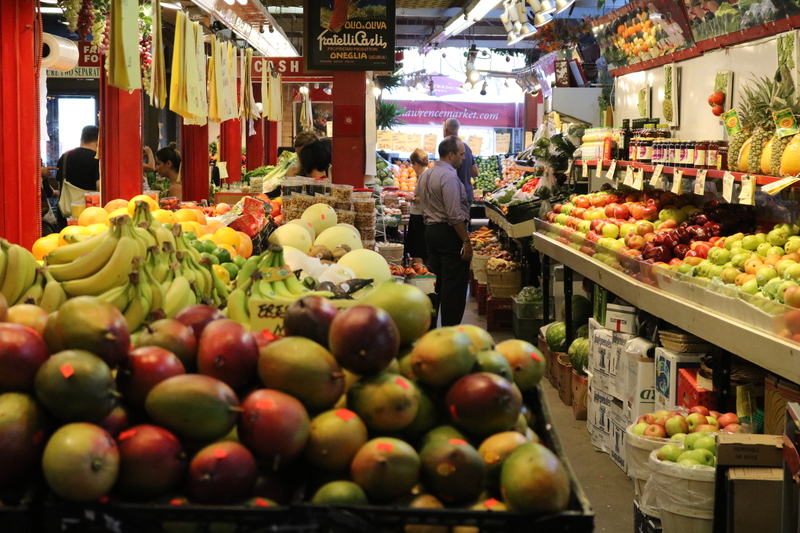 Here are a few sample questions that will whet your appetite. 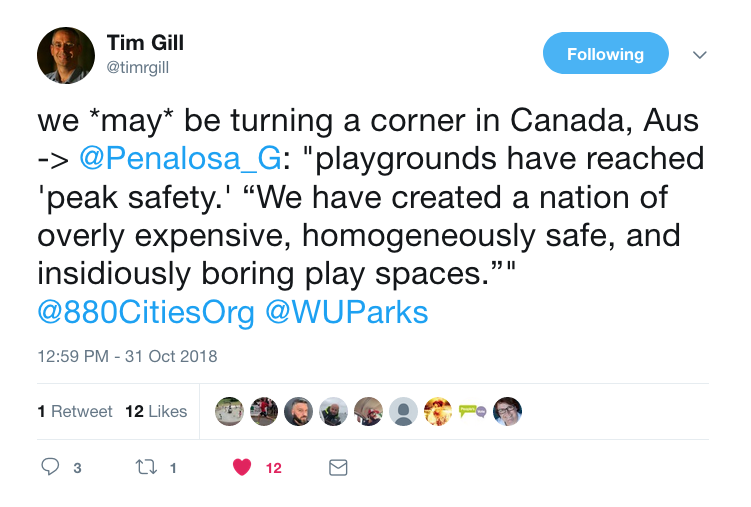 Do you feel safe letting your child play outside in your city? What has your city done to shape your feelings on this issue? What are some of the biggest challenges in raising young children in your town/city? How and where do you find community and support as a parent in your city? Don’t delay, click here and complete your survey today. By doing so, you will help provide a foundation for more informed and relevant reporting on kids in the urban world from the good folks at CityLab. 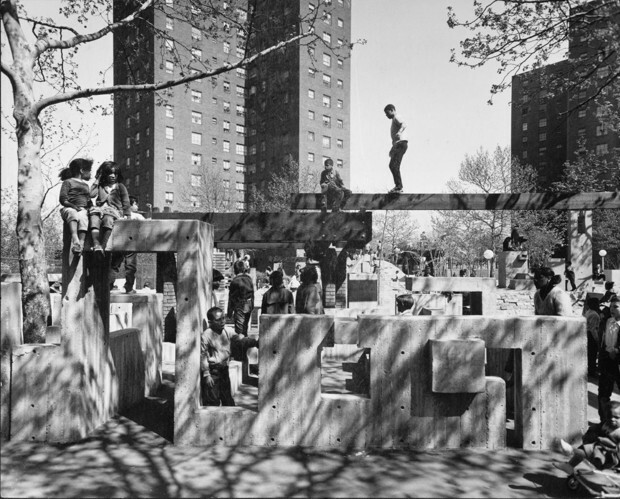 From Mimi Kirk’s CityLab article Can We Bring Back Riskier Playgrounds? Photo credit – Lady Allen of Hurtwood Archives, Coventry, U.K.
Take a few minutes and share your thoughts. We will all benefit from more insightful stories that put children first.